Florida Keys Hotels range from the tiny to the sprawling. From the quaint to the quirky. From the.......do I need to go on? What you want to know is where the hotel is, how much it costs and all the local amenities that will make your Florida Keys vacation be the trip into paradise that you are hoping for. The guide below stretches over several pages, because as you can imagine there are many things to show you when it comes to picking the best Florida Keys Hotels that your budget will survive. So to make it easier for you we have arranged the content into several sections, and rest assured if the Florida Keys hotels that you are searching for aren't showing, we will be adding more on as soon as possible. This site is built by just little old me, so its taking me awhile to get round to them all. But I will do it I promise you. So, as I was saying the sections start with Key West, then go to Key Largo, and even cover things like the best Gay Friendly or Clothing Optional Hotels that we can find. So start looking around and remember when you visit please drop us a line and give us a review of your stay, to make this site the best most up to date content on Florida Keys Hotels....and the Keys as a whole. Why Not Do A Quick Check On Today's Prices ? If you are planning on spending sometime down at the southernmost point of Florida you will certainly be spoilt for choice when it comes to choosing a hotel. As I generally say on all the pages, my main consideration when visiting is how close to downtown do I want to be, as this is where all the activity takes place. You see Key West is what I would call a 24 hour a day place, and with the bars and nightclubs not closing until the early hours, many people feel they have made a mistake when choosing a hotel right in the middle of everything, say near Duval Street or Simonton. Don't let that put you off as you can be close-by to the major stuff, and still have a secluded beach or garden, to take you away from the madness into your own private refuge, but this of course normally costs. 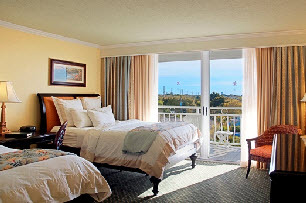 You can also get a room a little out of town, as Key West is such a small place that hiring a taxi, bike ride, or even jumping on the cities bus service will not be too much of a problem for you, and will definitively save you some cash in the long run. So whether its one of the gay and proud of it hotels such as Pearls Rainbow Guesthouse, or a step straight into Key West history at the Casa Marina. We have the very place for you. So take a good look at all the Florida Keys hotels that we currently have reviewed in the different areas, and please once you have visited please come back to us and leave a review of your stay. Hopefully it will a glowing testament to just one of the Florida Keys hotels that has tourists and travelers returning year after year. Key Largo is a funny old place really. Such is the desire for people to get down to Key West on the old Overseas Highway, that they quite often go whizzing past Key Largo, and subsequently miss out on staying at some pretty lovely Florida Keys Hotels. As Key Largo is the most northerly of all the Florida Keys islands, you can reach it easily within a couple of hours from both of the major airports found in south Florida: Miami International and Ft Lauderdale. "Yeah, we will stop here for a few days before traveling further south"
Jules Underwater Lodge In Key Largo...You Will Sleep Deeply!! Well it has diving to kill for and in John Pennekamp State Park has the first underwater state park in America, which celebrated its 50th birthday in 2013. It also has the Spiegel Grove, a huge naval vessel deliberately sunk off the shore of Key Largo to make an artificial reef and of course a great place to dive. We could go on and on and list the everglades, Kayaking, bars, fishing and of course a great selection of rooms to lay your weary bones down for the night. Go on give Key Largo a go.....you know you want to. Islamorada is not much more in to the Florida Keys, than Key largo really. Its only another 13 miles, so as you wind your way down through the Keys you might find Islamorada the perfect place to stop off for the night or a few days. Known as a village of islands (due to it actually being made up of six keys) this is where sports fishing really goes to town. With a huge amount of top class fishing tournaments, and experienced charters and ship captains ready to take you out, this is the place to go if you want to experience angling like you can only imagine. Marathon is known as the Heart of the Florida Keys, and it really is about as central as you can get. So if you are looking for a base to travel around the Florida Keys then you cant do better really. Fancy going down to Key West, then simply drive down and grab the park and ride and enjoy yourself but save a huge amount in the cost of booking one of the Florida Keys hotels. The same can be said for Key Largo, Big Pine or Islamorada. Visit them all but use Marathon as your base.